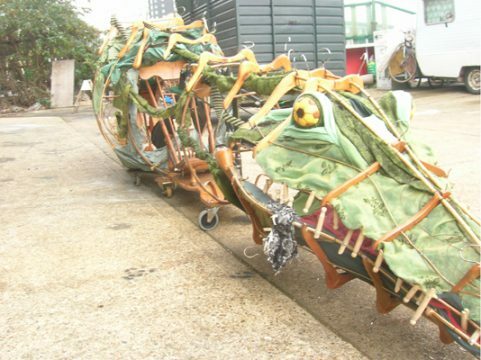 From a concept by Designer Bill Dudley and Puppet Consultation from Sue Buckmaster I was asked to make the Crocodile for the Kensington Palace Gardens Tent Production of Peter Pan in 2009. The show’s animal characters were to all be puppets made from the objects and fabrics that you might expect to find in the children’s dormitory. So the Crocodile was made as a skeleton of coat hangers for vertebrae with copper tube as “ribs”. 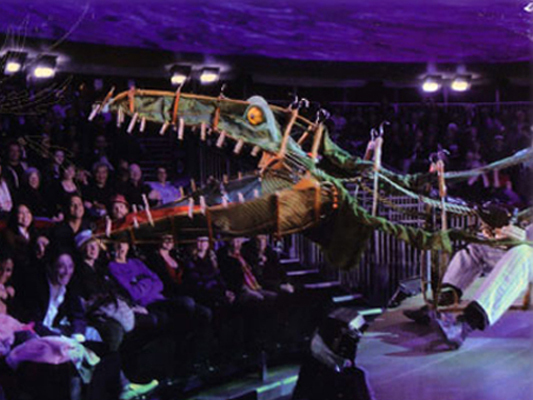 The main body parts divided into front and back skates with a floating joint and puppeteers legs clad in fishing waders would act as the Crocodiles’s own. 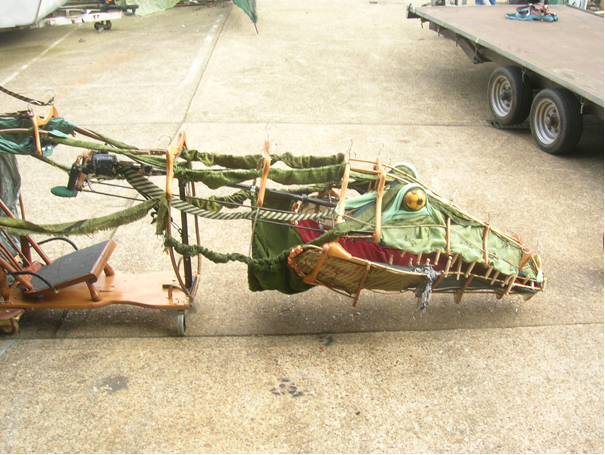 The front puppeteer sat on a rocking chair and provided the directional steer whilst operating a 3 stage mechanism for Neck/Head/Mouth. Forward thrust came from the back puppeteer who was laying face down on a kind of gym horse and could wag the tail with a lever. Accommodations from the brief were a narrow width restriction for entry and exit and the ability to drop/disengage the lower jaw and re-engage it for Hook to jump into a stage trapdoor. The whole structure was dressed sparsely with green toned pyjamas, school Ties and socks. 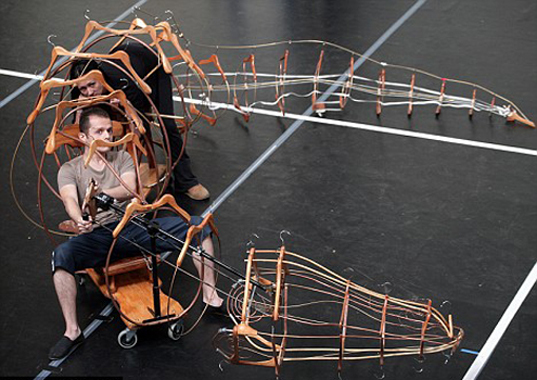 My whole emphasis was to get the slightly abstract creature to be impressive with its range and fluidity of movement and to be as intuitive for the puppeteers as possible, hence the head & neck movement would be mirrored off a steering pad type control in front of the Puppeteer. Especially gratifying was to watch the clothes peg teeth reach to out to the front row and hunt around for a victim. 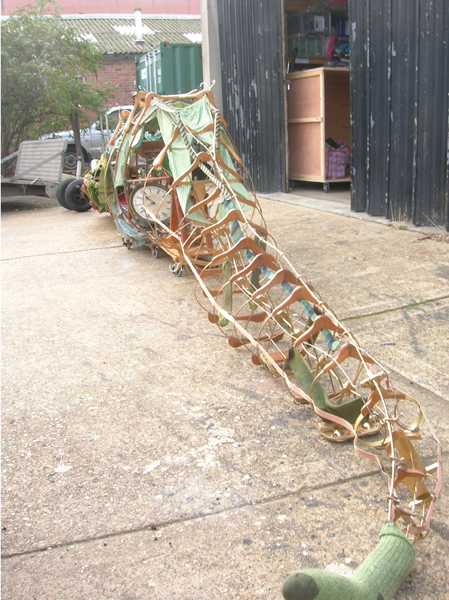 Fabrication assistance for me on this project were:- Iola Weir, Emma Garofalo and Natasha Bissarre/Cossey.